Grafting and budding knives are designed specifically for these purposes and should not be used for carving and whittling wood. They are available in either left- or right-handed models. The blade is beveled on only one side, unlike conventional knives, which have blades that bevel on both sides down to the cutting edge. Grafting and budding knives must be kept razor sharp so they will cut smoothly. Pruning and lopping shears should be the scissors or sliding blade type rather than the blade and anvil type. If used to harvest scion wood or budsticks, blade and anvil pruner will crush plant tissue. As with knives, pruning and lopping shears should be kept razor sharp to give clean, close cuts. A special device known as a grafting tool has been designed for making the cleft graft. It is used when the rootstock’s diameter is greater than 1 inch. The wedge-shaped blade is used to split the stock, and the flat pick opens the cleft so that the scions can be inserted. Once in place, the flat pick is removed and the cleft comes together to hold the scions in position. Wax melters are used to heat the wax for sealing graft and bud junctions. They are usually made by modifying kerosene lanterns. The chimney is replaced by a small tin pot that serves as a receptacle for the wax. When the flame is kept low, the wax is melted without burning and can be kept at a suitable temperature. The specialized terms listed here are often used in discussing grafting and budding. The drawings in Figures 19 through 22 will help in understanding these terms. Adventitious buds – buds that can produce roots or shoots at an unusual location on the plant if environmental conditions are favorable. Bark – all tissues lying outward from the vascular cambium. Bud – an immature or embryonic shoot, flower, or inflorescence. Budding rubber – a strip of pliable rubber 3/16 to 3/8 inch wide by 4 to 8 inches long and 0.01 inch thick used to hold a bud in proper position until the plant tissue has knitted together. Callus – undifferentiated (parenchyma) tissue formed at a wounded surface. Cambium – a thin layer of living cells between the xylem (outer sapwood) and phloem (inner bark) that is responsible for secondary growth. Because cambium cells divide and make new cells, the cambia of two different but related plant will grow together if they are fixed and held firmly in contact. Compatible – plant parts (scion and rootstock) that are capable of forming a permanent union when grafted together. 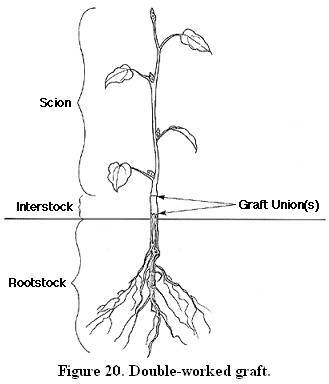 Double-worked plant – a plant that has been grafted twice, usually to overcome incompatibility between scion and rootstock; it consists of a rootstock, interstock, and scion. Graft – a finished plant that comes from joining a scion and a rootstock. 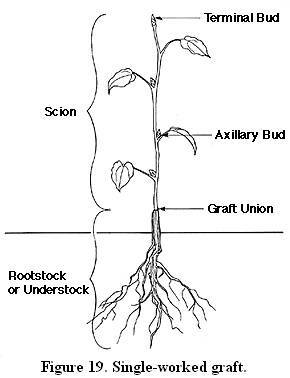 Graft or bud union – the junction between a scion or bud and its supporting rootstock. Grafting paint – A mixture used like warm grafting wax to cover wounds and prevent drying. It requires no heating before use and dries to a moisture-proof seal when exposed to air. Unlike conventional paints, it does not damage plant tissue. Grafting strip – a rubber strip used to hold scions in place until knitting has occured. Grafting strips are thicker and less pliable than budding rubber. Grafting twine – treated jute or raffia used to wrap graft junctions to keep scions in place and cambia properly aligned. Incompatible – plants whose parts will not form a permanent union when grafted together. lnterstock – an intermediate plant part that is cornpatible with both the scion and the rootstock. Used in cases where the scion and rootstock are not directly compatible with each other or where additional dwarfing and cold or disease resistance is desired. Parafilm – registered tradename for a nonsticky, selfadhering parafin film. Can be stretched over a bud or graft to hold the bud or scion in position as well as to seal the junction. Used in place of a rubber strip or twine. Polarity – a condition where stems grow shoots at the apical or terminal end and roots at the basal end. Raffia – One of several materials available for securing scions or buds to the rootstock, A natural fiber from the fronds of the raphia plam, raffia is one of the oldest materials in use. It should be graded for uniform size and length and moistened just before use to make it pliable. Rootstock – the portion of a grafted plant that has (or will develop) the root system onto which the scion is grafted. 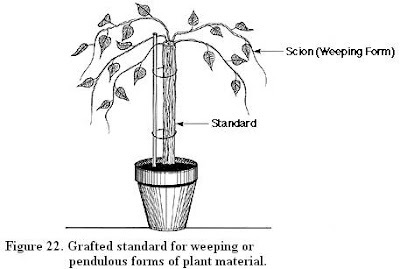 Scion – a plant part that is grafted onto the interstock or the rootstock. The scion usually has two or more buds. Single-worked plant – a plant that has been grafted once; it consists of a rootstock and a scion. Standard – a single-stemmed understock used for the production of weeping forms of woody plants. One or more scions are usually grafted relatively high on the understock (2 to 6 feet). 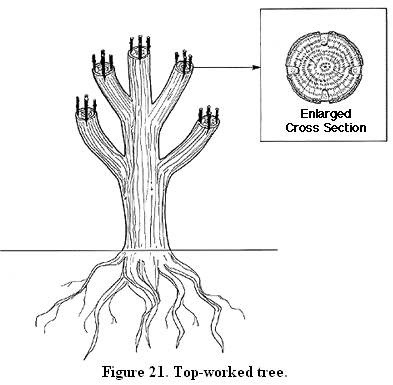 Top-worked plant – an established tree or mature plant whose upper portion has been removed back to the main limbs or trunk and then grafted with new scions. Understock – same as rootstock. Union – the point where the scion and rootstock are joined. Warm grafting wax – a mixture, usually consisting or beeswax, resin, and tallow plus a fungicide, that is applied warm over a bud or graft junction to prevent drying and to serve as a topical dressing.